Big City Bread Cafe is open seven days a week, serving Breakfast Monday through Friday, Brunch on Saturdays and Sundays, & Lunch and Dinner Monday through Saturday. Order at the counter and enjoy the relaxed atmosphere and our friendly staff. Our indoor and outdoor dining area and bar Event Spaces are available for your Catered Special Events, or we can cater an event at the location of your choice. Dinner is always served Monday-Saturday, so please come on by! With our recent switch to counter service, reservations are not necessary, but please call to let us know about special needs or numbers for a large party. Call (706) 353-0029 during restaurant hours. Let us cater your next event, meeting, party or luncheon! For comfortable year-round dining, our indoor dining areas and bar are great for family dining, romantic dinners, a party of one, or large parties or events. At Big City Bread, we believe in flowers everyday, and for our dinners, we like to dress things up with white linens and candlelight. Also, please enjoy our ever-changing display of art by the many talented local artists of Athens while you dine. Our courtyard is famous for its elegantly shaded outdoor seating "under the Elms." For years, Athenians have loved sharing a meal outside with colleagues, friends and family in our near-year-round warm southern climate, but when the wind gets chilly in the winter months, we've also got fires to help keep you cozy. 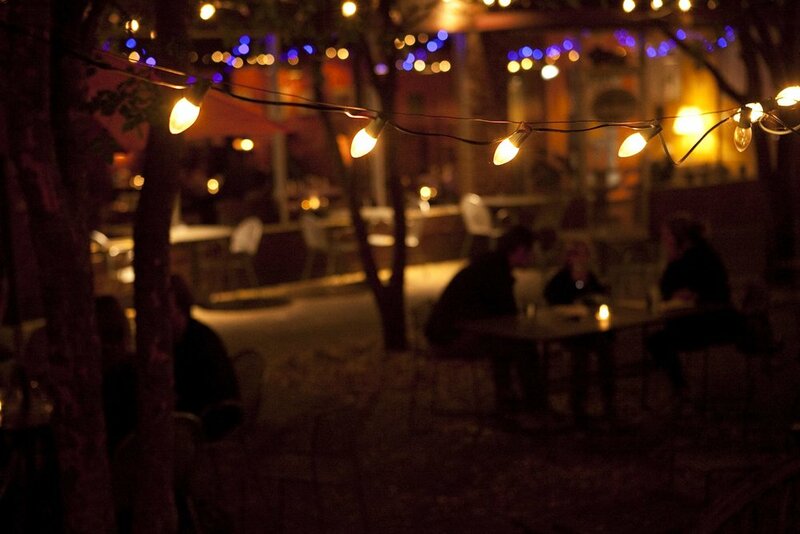 Our courtyard is also a great place for a wedding reception, event or party! about Dinner Reservations, Catering or Special Events.